The Premier League Writing Stars competition encourages and inspires children to write poetry and, this year, the competition was centered around the theme of diversity. Over 25,000 entries were handed into the Premier League from children across the country and the Town Foundation’s Primary Stars Coordinator Adam Davies, alongside Michelle Hodgson – the Director of the Huddersfield Literature Festival – read through 120 Town entries before deciding the winners. Six-year-old Isobelle Sykes at Netherton Infant & Junior School was the winner for Key Stage One and was lucky enough to be presented with her prize by First Team Goalkeeper Ben Hamer! one card can’t play the game Snap! but together we’re so cool! 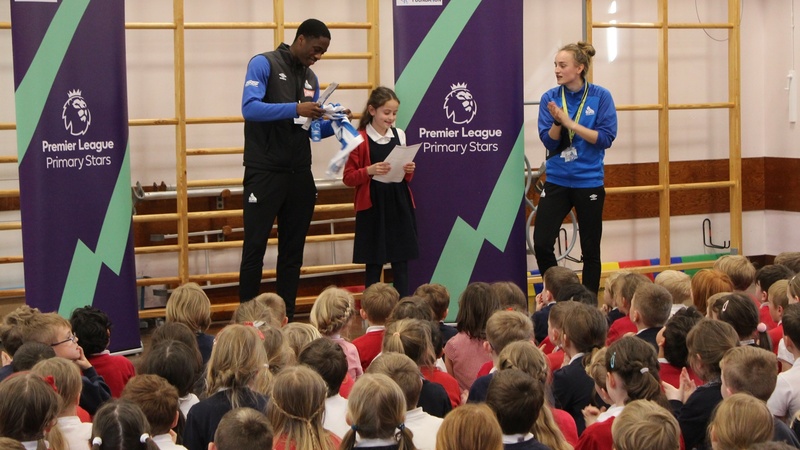 Later in the week, Key Stage Two winner, 10-year-old Isabella Netherwood from Upperthong Junior and Infant School was surprised by defender Terence Kongolo! Your school can get involved in Premier League Primary Stars by visiting the website www.plprimarystars.com and signing up for free! Or if you would like to have Huddersfield Town staff deliver in your school please contact Adam Davies via adam.davies@htafcfoundation.com. To find out more about the Huddersfield Town Foundation and the work they undertake in schools please visit www.htafcfoundation.com.